Banks Recruit Investors to Oppose Honest Valuation of Assets; Just how Unprepared are Banks for Major Losses? Reader "Henry" has a question on the loan loss provision chart I posted in Former Fed Vice Chairman vs. Mish: Is the Fed Out of Ammo? Thanks for writing and sharing your wonderful column. It has been very informative and educational. Could you please help us mere mortals decipher the ALLL/LLRNPT chart in a follow up post? I have difficulty reconciling the units, and I suspect I’m not the only one. Exactly what does that chart depict? The ALLL is a bank’s best estimate of the amount it will not be able to collect on its loans and leases based on current information and events. To fund the ALLL, the bank takes a periodic charge against earnings. Such a charge is called a provision for loan and lease losses. One look at the above chart in light of an economy headed back into recession and a housing market already back in the toilet should be enough to convince anyone that banks already have insufficient loan loss provisions. 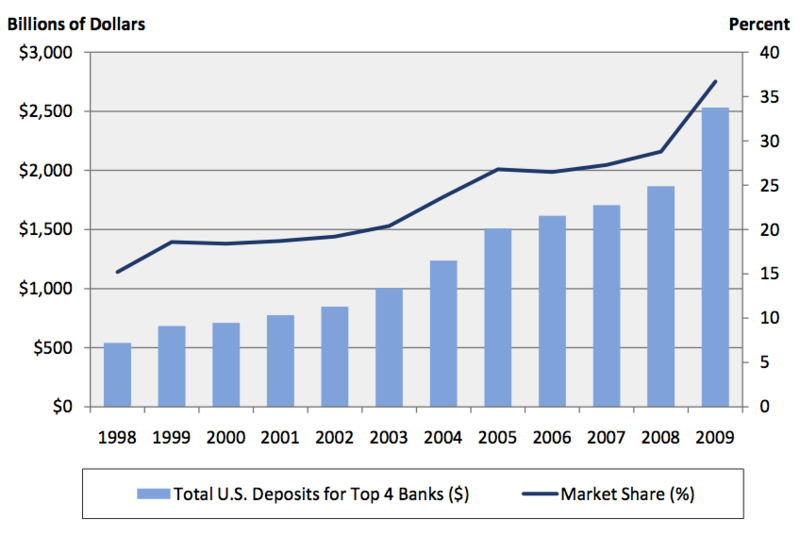 That is one of the reasons banks are reluctant to lend. Lack of creditworthy customers is a second. Quite frankly would be idiotic to force more lending in such an environment. 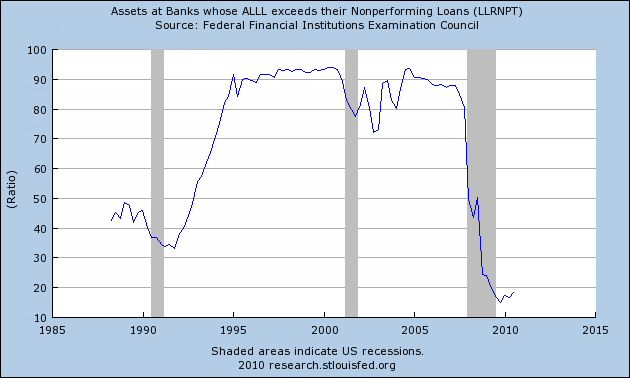 To further clarify, the chart depicts the ratio of loan loss provisions to nonperforming loans across the entire banking system (all banks). There are 33 ALLL charts by bank size and region for inquiring minds to consider. The above chart is the aggregate. 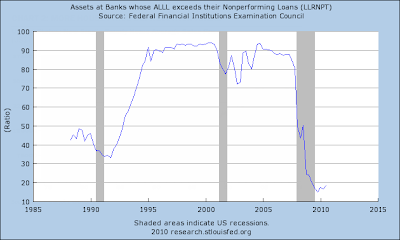 The implication what the chart suggests is that banks believe nonperforming loans are NOT a problem (or alternatively they are simply ignoring expected losses to goose earnings). The implication what I suggest is banks earnings have been overstated. Why? Because provisions for loan losses are a hit to earnings. I believe losses are coming for which there are no provisions. The chart depicts a form of "extend and pretend" and overvaluation of assets on bank balance sheets. The Fed and the accounting board ignore this happening (encourage is probably a better word), hoping the problem will get better. With more foreclosures and bankruptcies on the horizon, I suggest it won’t. What follows is a more comprehensive re-write of my take on the latest bailout proposals by the Obama Administration. I felt the original write-up was a bit rushed and one-sided. I have tried to outline the objectives of the bailout plans more dispassionately. And I have added some historical references from prior posts to demonstrate the basic merits of the idea. Clearly the mindset will not change. It’s all bailouts, all the time in the Obama Administration, as it was at the end of the Bush Administration. I want to talk about the most recent bailouts, why they were proposed, what’s wrong with them and why bailouts generally don’t work. My remarks will concentrate on the principal reduction program since this is the newest bit. What should be clear to you as an observer by now is that these bailouts implicitly assume that government can stuff financial institutions full of taxpayer money and in so doing adequately recapitalize them so that they can lend again. The thinking is that, these policies, while "deeply unpopular, deeply hard to understand," are necessary to prevent another systemic breakdown and a deflationary spiral. Also implicit is the assumption that economic weakness depends in large measure on supporting home price values by increasing the supply of credit via bank lending and securitizations. But, as I argued 14 months ago when Barack Obama came to the White House, the financial system is so fundamentally unsound that bailouts are like catching a falling knife. The writedowns that needed to be taken – in the absence of serious house price appreciation – are just too large to be handled quickly via bailouts. Moreover, it is the demand for credit which is critical here because households are over-indebted and reluctant to take on further debt. While I do believe officialdom can be successful in creating mild but brief cyclical upticks in consumer demand, weak consumer spending will last for years. The secular trend is clearly going to be toward increasing savings and reducing debt.